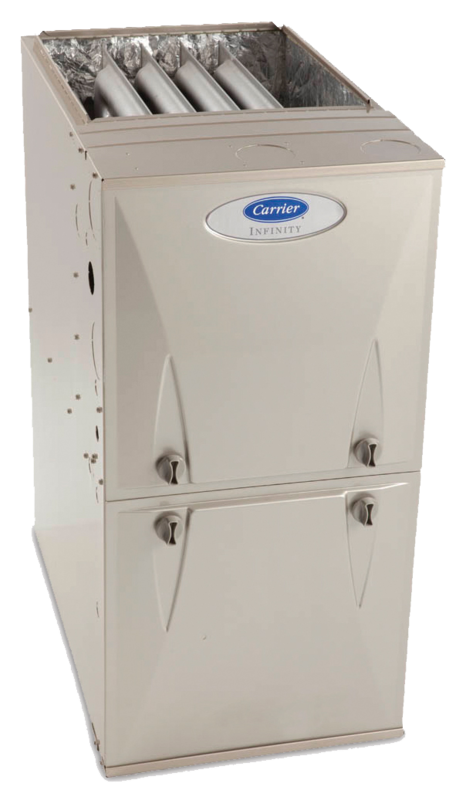 Carrier Infinity 98 Furnace 59MN7A - Air Makers Inc.
Are Tankless Water Heaters Economical? The 59MN7A Multipoise Variable-Capacity Condensing Gas Furnace features the Modulating Infinity™ System. The innovative modulating gas valve that can modulate up as well as modulate down is at the heart of this furnace’s extremely quiet operation, along with the variable-speed Infinity ECM blower motor and variable-speed inducer motor. This furnace also provides 3.5 times tighter temperature control than single stage furnaces. With an Annual Fuel Utilization Efficiency (AFUE) up to 98.5%, this Infinity gas furnace provides exceptional savings over standard furnaces, as well. A Carrier Infinity® Control and an Infinity Air Conditioner or Heat Pump can be used to form a complete Infinity System. You Have Never Experienced Comfort Like This! Go ahead and leave us your inquiry and we will be glad to confirm whether we would cover your area for an HVAC installation and/or a fast service call! Send Us Your Inquiry For A Quick Response!